"No, those slots are only for paying exhibitors. But I'll check with my manager and we'll call you back." Kind of disappointing for organisations and communities like the MSCC or the LUGM. I guess it is needless to say that I'm still waiting for their phone call... Anyway, Ish picked up the idea on last Saturday and also got in touch with the NCB via email. Most interestingly, his approach was way more fruitful and absolutely surprising and completely unexpected for any of us craftsmen he not only got one slot for topic presentations on Open Source, Linux and IT communities but three, and on top of that the NCB invited him to join them at their floor stand during the whole 4 days of Infotech to talk about Open Source. 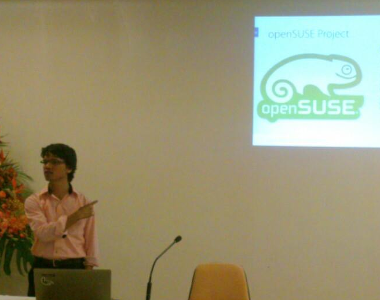 Fantastic and well done, Mr openSUSE advocate! It's about lots of discounts and sell as much as you can. Empty the dust-covered shelves and sell it to the masses. Oh, you might day I'm too sarcastic about that? Hm, no I don't think so. Even when you have a conversation at some of the booths, and you ask for a couple of products being advertised - guess what? "Well, we didn't receive the item yet. Maybe tomorrow afternoon." Compared to last year, there is not a single institution of tertiary education re-presented. Kind of shocking to my opinion. But again, I think this simply emphases the aspects of a tech-sales market rather than being a platform to show-case and demonstrate latest IT gadgets. As mentioned, Ish got the offer from the NCB to talk about various topics using their available slots. First, as we were all too early we went to check the conference room - location, size, equipment, etc. All okay and next we tried to find someone in charge to get us going. Back at the NCB stand, it took quite some time until we got the right person. Anyway, nothing to complain or worry about as there was still plenty of time. 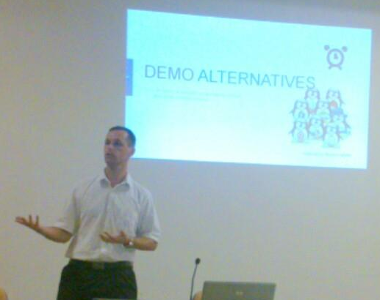 Despite the set time slots we decided to swap the sequence of our three presentations, so that they match more closely to Monday at the Linuxfest 2013. And I had to leave early, too. Kicking of the sessions, I went quickly through my slides and spent more time on the actual demonstration on how to run Windows software on Linux. Apart from a small hiccup in Microsoft Word 2007 Reading View all went smooth and stable. Overall it took me about 40 minutes to talk the various options and possibilities that could simplify your move from a Windows desktop to a Linux-based system. But for sure, I have to get rid off some visual effects on the slides and cut some demo material for Monday. I'm going to have 20 minutes only... Nice challenge! Luckily, I could stay some more minutes and enjoyed the presentation of Nirvan and Nayar about the MSCC. Both did a very good job, even though that the laptop used gave them a hard time. Ironically, it's a Windows system... okay, okay, just kidding! Afterwards some minor advice, like using a dedicated Windows user account only for the presentation (which avoids nasty notifications from the Systray area), and to uncheck "Show Desktop Icons" in order to show a clean and empty desktop background on the big screen. Hm, which actually reminds me to choose a better background image for Monday, too! Experimental... It's been a while since I spoke in public. Well, this time it was only a small audience but I'm really excited about what's going to happen at the Linuxfest 2013 on Monday. I'm really looking forward to an awesome experience and to meet lots and lots of enthusiastic young people. 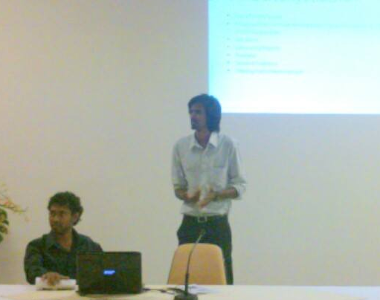 "I won’t be too long explaining in words how was the Infotech 2013 edition but in one word, I would say “Worst”." The Mauritius Software Craftsmanship Community (MSCC) has its 6 month anniversary, and as the founder I would like to Thank You all our craftsmen for their interest, engagement, ideas and support during these months! Brief report about my presence at the Virtual Launch of Visual Studio 2013 Dubai at the premises of Microsoft Indian Ocean Islands and French Pacific.